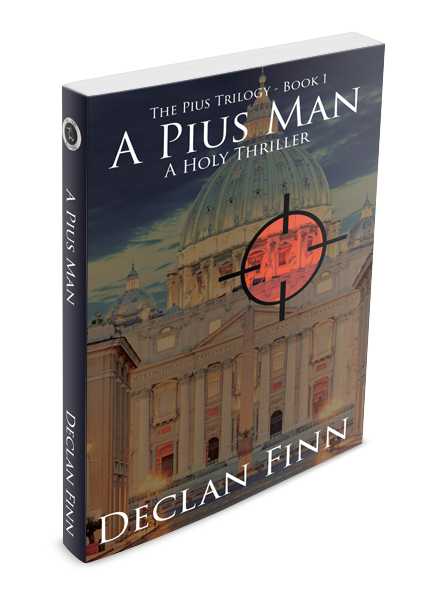 So, book one of my epic thriller series, A Pius Man: A Holy Thriller, will be only $0.99 from now, this minute, until 11AM Eastern on Wenesday, October 4.For those of you who don’t recall what A Pius Man is about, the flap copy reads as follows. I won’t be pretentious and say that this is my masterpiece. If I knew what I was doing, it probably would have capped a 12-novel series, and included everyone from Merle Kraft (from Love at First Bite) and almost everyone in the cast would have appeared in other novels as bit players. But it does have a love story, a spy story, an action adventure novel, a murder mystery, a techno-thriller, geopolitical war gaming, and the cast of the Lord of the Rings… Okay, that last part is a bit of an exaggeration. Though one of my goals was go make it look like every Catholic conspiracy cliche ever… and then flip the script. I have a pale, silver-haired priest with combat skills. I have the “Ultra-right wing” Pope… who is African, though I didn’t know who Cardinal Sarah was at the time. I think the only cliche I kept was an evil Cardinal, but that’s mostly because he’s an idiot from Boston, and when I first wrote it, Cardinal Bernard Law was a household name, and his idiocy made me want to bang my head against a wall. Though as I look at the page for Pius, I see that people who viewed it also viewed: Forbidden Thoughts, and Carnage and Culture. Heh. That’s some … interesting company to be in. APM will be on sale for $0.99 from September 27th through 8:00 AM PST Wednesday, October 4.